During my week taking part in the Eat Local Challenge – something I am *still* trying to incorporate into my normal routine – I had my second article due for Deep Dish over at Atlanta Cuisine. It was easy to be inspired by all of amazing produce available at the local farmer’s markets during the summer months. Beautiful heirloom tomatoes came together with a small organic-ly grown watermelon, fresh basil, and Sweetgrass Dairy goat cheese to make this delicious summer dinner salad – great textures and flavors all combined with the added bonus of being grown locally. While some of these items may not be plentiful where you are this time of year, the premise is still the same: use what is in front of you at the time….for freshness in both taste and ideas. The loosey-goosey recipe for this salad is here at the end of the post but you can read the full article here at Atlanta Cuisine. If it’s true that you eat with your eyes, my eyes are salivating over those beautiful colors!! Amazingly simple and beautiful! I love this idea and am going to track down some heirlooms on farmer’s market Thursday this week. Yum! Have I mentioned that I adore you? Yeah . . . I’m still your biggest fan. This is really beautiful. I never would have thought to combine melon with tomatoes. This is now on my menu for the coming weekend. this looks FRESH! i love it. i’m a huge fan of watermelon salads. i’ll have to try. Tomatoes and watermelon are both so versatile but I never thought about putting them together. Nice colors from the green heirlooms! Looks beautiful and all the items are available fresh grown in NJ where I live. It’s such a simple dish but I bet it tastes wonderful. I plan to try this one. 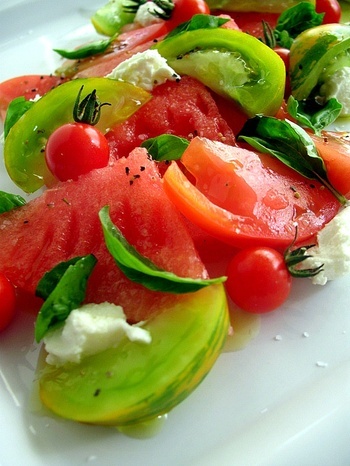 Perfect summer salad… I rarely drool over salads but this is an exception. Reminds me of that ferran adria tapas recipe. When are you going to be on Splendid Table on NPR? Oh, i love watermelon and tomato. the only thing better than a really good, fresh salad is a really good, fresh salad that looks like candy.